Microsoft Windows covers a breadth of audiences from consumer, to IT professionals to developers. With more than 1 billion customers worldwide and 100 target languages, translation and localization activities span from user interface localization to digital marketing, developer kits, licensing agreements, and many other text and domain types. Ulrike Irmler, who manages Window’s localization team, will give an overview of the Windows business by presenting several end-to-end localization scenarios (user interface, web content, developer and consumer). She will focus on market-strategy, translation challenges, standards and linguistic quality. Ulrike will also discuss the latest translation paradigms such as machine translation and crowd sourcing in the context of large-scale enterprise localization. This entry was posted in careers, Events, GSTILE lecture series, Translation and Localization Management and tagged careers, GSTILE, international, languages, Translation, work on March 26, 2010 by Renee Jourdenais. If you are interested in becoming a translator, I recommend you enroll in a good university-level translation program. The best in the States is offered by the Monterey Institute of International Studies, but there are also good programs elsewhere, including several offered online (among these, the program offered by the University College of Denver University, where I teach). The author has also written about business practices and other topics for beginning translators. This entry was posted in Translation and tagged networking, on the web, Translation on March 24, 2010 by sarspri. Economically advanced nations currently reflect a curious twist in reasoning. In spite of strong historical support for parallel economic and aesthetic development in the history of modern Western nations, education systems in many nations today are reducing art, music, and literature in their curricula. Teachers of the humanities and arts hold less prestige than their counterparts in the sciences and mathematics. The inextricable links between the development of science and advances in aesthetic creativity go unnoticed in current arguments for denying opportunities to learn creativity, work across media and modes, and develop expertise in visual perception and renderings of imagination in sketches, drawings, and models. Technological advances make imperative the “reading,” embodying, and creating of images to such an extent that neuroscientists now see these ways of learning as grounding cognition. This lecture considers these research findings in terms of implications for human learning across the life span. This entry was posted in Events, GSTILE lecture series, Language Education and tagged education, GSTILE, languages, research, speakers, work on March 16, 2010 by Renee Jourdenais. Learning a language can open up a whole new world to people. Many students pursue language study precisely because they want to get involved in making this world a better place. International development has always had a strong pull for language students, offering a chance to travel and experience other cultures while doing good. It is a broad field where one may leverage special interests and knowledge, like health care, law, or business, into a fulfilling exciting career. A recent “Career Focus” feature article in The Language Educator highlighted the importance of combining language skills, experience living and working abroad, technical expertise in areas such as business and public administration, with characteristics such as being pro-active, self-motivated, adaptable and able to embrace the unexpected. 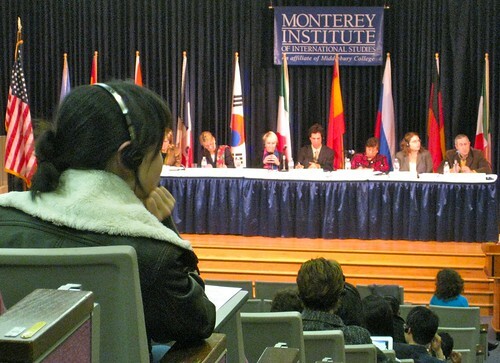 In addition to discussions of the Peace Corps and other international organizations, a significant section is devoted to detailing various Monterey Institute programs and alumni, including a discussion of our unique language offerings by GSTILE Dean Renée Jourdenais, and photos and stories of alumni in the field: Jonathan Axtell (MBA ’08), Ravi Dutta (MPA ’09) and Pete LaRaus (MPA ’04). foreign language educators and administrators as members. The Language Educator is ACTFL’s newest publication; it provides comprehensive coverage of foreign language teaching and administration, and serves educators of all languages at all levels as a single, comprehensive source of news and information. Copies of The Language Educator are available in the MIIS library, and ACTFL members can read the full issue online. This entry was posted in careers, Language Education, News and tagged ACTFL, alumni, careers, languages, publications on March 4, 2010 by sarspri. A recent career fair panel discussion hosted by GSTILE assembled representatives from a remarkable range of professional associations from across the interpreting spectrum. Sometimes we participate in events in our lives when we don’t really fully understand the complete significance of those events. I’m going to suggest that this might be one of them for you, because if you look at this panel, I doubt that you will ever be in a room again with this kind of expertise all assembled at one time. Many thanks to the panelists as well as all who organized, contributed to, and participated in this event. This entry was posted in careers, Interpretation, News and tagged careers, GSTILE, Interpretation, languages, professional associations on March 1, 2010 by sarspri. This past Fall the MA TESOL program was re-graced with the presence of three of its returned Peace Corps Master‘s International (PCMI) students: David Chiesa, Ryan Damerow and Heather Kokesch. The three returned Peace Corps volunteers (RPCVs) were previously serving as tertiary-level education volunteers teaching English. David and Ryan served in China, while Heather served in the Philippines from 2007-2009. The three returned in the Summer of 2009 and began classes last Fall. Spring 10 will be their last semester at MIIS all three are MA TESOL and LPA certificate candidates. Current PCMI students in the field include Kristina Swamy serving in China, Mica Tucci serving in El Salvador, and Kristine Balderelli serving in Kazakhstan. The GSTILE office has made a point to send them holiday cards, care packages, and most recently valentines. As it has become tradition to send packages to our volunteering students once again we were able to solicit assistance from local businesses such as Whole Foods and Trader Joe‘s to assist in sending out some pretty hearty packages. Thank you to everyone who has contributed to these packages to help support our PCMI students for all of their selfless service. This entry was posted in Language Education on March 1, 2010 by GSTILE.